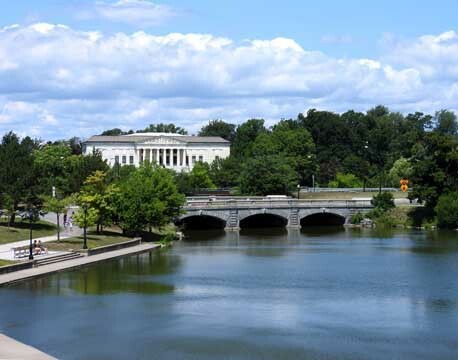 The Classical white marble building on the North Bay of Delaware Lake in Buffalo is architecturally and historically significant for four main reasons. First, it.is the only surviving structure from the enormously popular Pan-American Exposition of 1901, which hoped to encourage North and South American economicties after the Spanish-American War. Its architecture is a symbol in stone of the brash interventionist democracy of America at the turn of the century. Second, in the public memory the Pan-Am building also serves to memorialize the fair's most important visitor, President Wiliam McKinley, and the dramatic and violent events that followed his assasssination. In the most public of American assassinations, on the day McKinley was shot by an anarchist nearby in an Exposition hall (now demolished) over 100,000 people were in attendance. Third, the Pan-American Building is a major unaltered example of the work of the beaux arts architect George Gary, who also designed the additions in 1927-29, maintaining the "aesthetic unity of the building. Finally, since 1902 the white-marble ediface has housed the Buffalo and Erie County Historical Society, which has ensured its preservation and upkeep. The buiding has also served as the central repository for artifacts and manuscripts significant to local history, and of national events that touched closely on that history. Among its many collections, the Buffalo and Eri County Historical Society holds an outstanding store of Pan-American memorabilia.